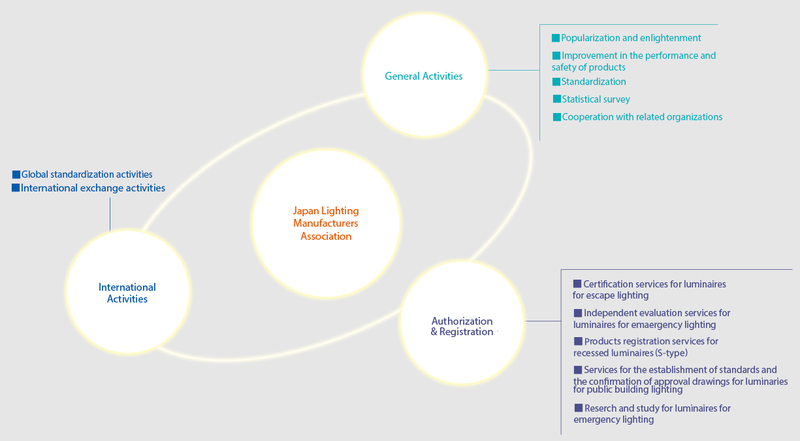 Japan Electric Lamp Manufacturers Association (JELMA) and Japan Luminaires Association (JLA) were restarted with Japan Lighting Manufacturers Association (JLMA) newly established through a consolidation-type merger on April 1, 2013. JLMA is a general incorporated association consisting of manufactures manufacturing and selling light sources, materials and parts for lighting, control-gears and luminaires, and related organizations, and its aim is to contribute to the development and promotion of the lighting industry, the securement of safety of people’s lives, and the enhancement of culture of life. JLMA are working for popularizing the better lighting culture and more environment-friendly energy saving products.